As a restaurant owner, the holiday season is often the busiest time of year. Months in advance, your staff is taking reservations for holiday parties, and your chef is selecting the holiday specials you will be serving up. You have been through this so many times, so you know what needs to get done to get your restaurant ready for the holidays. 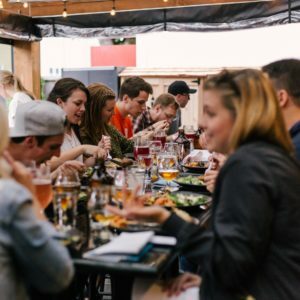 But with everything going on in the restaurant, you may begin to lose track of all the things that need to happen outside of your restaurant. These are things like updating your specials board, your website, social media, local listings, and advertising campaigns. The better you can present your holiday deals on those channels, the more people will want to come! Did you know that 97% of consumers search for local businesses online? It is incredibly common for people to look at your restaurant online (on platforms like Yelp, Google Maps or social media) before deciding to go there. A recent study, by National Restaurant News, found that “restaurants” were the most searched category on the go. At KWSM, we have numerous restaurants, bars, and other brick & mortar clients that work with us to ensure everything is ready for the holidays. The checklist below is what we use with them to spice things up during the holidays. (No pun intended). That is totally normal. Digital marketing is a lot of work! But we can reassure you that if you sit down and really focus, you can get through this checklist before the holiday season. If you need help getting your restaurant (or storefront) ready for the holidays, reach out to KWSM: a digital marketing agency to help you out. Is your website ready for the holiday season? Today’s consumers expect to have a flawless experience on the Internet. They want to shift seamlessly from their mobile devices to their laptops without ever missing a beat. Your website must be ready. CONTACT US to schedule a complimentary 30-minute website audit.